Ride in the locomotive cab as we travel from Klamath Falls to Lakeview on the Oregon, California and Eastern Railway. 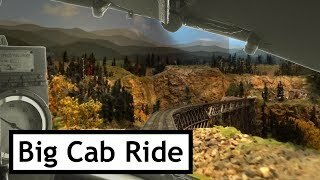 Filmed at the Colorado Model Railroad Museum in Greeley, Colorado. This is a revised edit of an earlier video of exactly the same name. In this revision I attempted to make the color corrections I should have made in the original version. The original footage was shot using the camera’s auto color balance. As the camera traveled through the layout, the auto color balance was frequently befuddled by the changing scenes and changing lighting conditions. I think this version is better. I hope you think so too. The museum website has extensive information about the layout, museum location, visiting Greeley, opening hours, and shopping opportunities in the museum gift shop.